I believe that after a person spends prolonged amounts of time in the mountains, they eventually realize that much can change in a relatively short period of time. A mayfly hatch for example, will turn a placid mountain stream into a splashing torrent of rising trout. Alpenglow, a mountain phenomenon known at dawn and dusk, can turn a depressing face of grey, barren rock into a canvas of purple, pink and violet hues. Even the most golden autumn day can turn cold and wintry, much like the temperment of the last two nights. To their surprise, our guests found the small, Victorian mining town of Ouray, dressed in a splendid wintry blanket of fluffy white. Yet everybody laughed and smiled as they always do. Ouray is the home to hot springs; vapor caves; beer gardens and spectacular scenery. 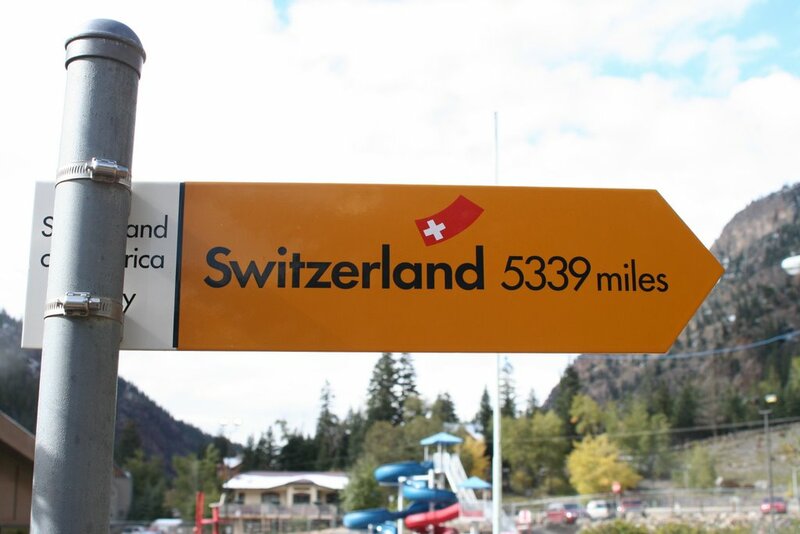 Most people know Ouray as the “Switzerland of America,” and just to confirm the title, an authentic Swiss signpost points the way in the center of town. It is hard to feel depressed about the snow when the environment looks incredibly beautiful and maybe even a little Swiss. Most Swiss people are avid hikers though, and we cannot forget that we are here to do the same. The upcoming weather forecast looks warm and promising. Even more, the fall colors appear spectacular. What were once relatively small, obscure patches of yellow illumination during the final weeks of August are now the full, dedicated brush strokes of a master artist at work. Long strokes of yellow, paint the surrounding mountainsides with astounding brightness, while golden speckles lie on surrounding patches of brown-colored earth, much like the flecks of fool’s gold speckle the pebbled bottom of a cold, clear mountain stream. Within a day, the sun will emerge, the snow will disappear, and everything will shine again with the brightness of fire. In the mountains, the ultra-violet rays beat down with the intensity of flame. Though beautiful, an early autumn snow can only vanish beneath a stubborn sun. In then end, the white blanket becomes a mere trickle and a memory. In the end, we realize that an early autumn snow is a mere appetizer for a much colder season much farther down the road. Layers of moist chocolate cake and creamy chocolate mousse with mango puree sauce and mint simple syrup. On a chocolate graham cracker crust, topped with whip cream and dressed with raspberry and chocolate sauce. Honey port poached pear, crème brulee, the list went on and on. As I drooled over the list of desserts and slowly swirled my glass of port, I thought about the similarities between a fine meal and the uncertainty of mountain weather. Snow, rain, sun and wind, they all conspire to provide a mouth-watering feast for the eye and soul. If you’d like more information concerning the Telluride Trek, or any of our tours, then please contact Ryder-Walker Alpine Adventures. We would love to hear from you. See you on the trail.